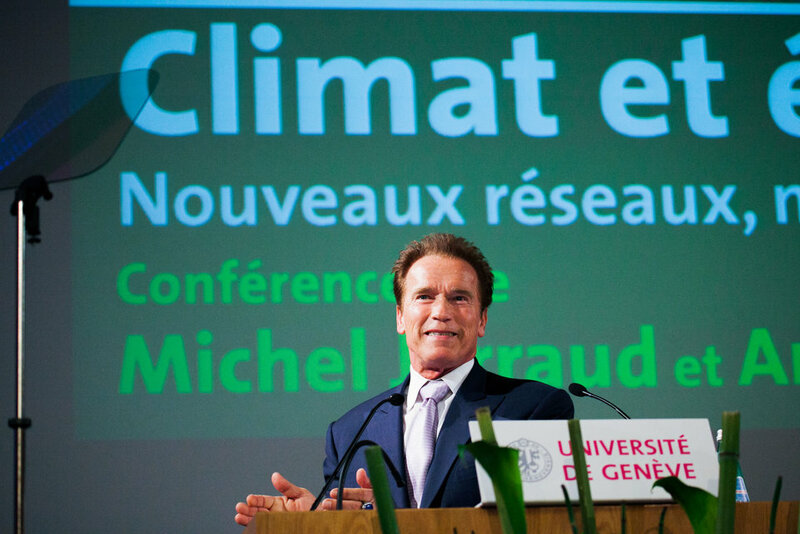 Governor Arnold Schwarzenegger was giving an official allocution yesterday in Geneva, at the occasion of the launch of his R20 foundation. The aim of the “Roadmap for 2020” foundation is to shed light of ecological challenges and put forward sustainable solutions available. An ambitious goal that requires tremendous charisma, as we know Mr. Schwarzenegger capable of. The entire speech and succeeding debate is available on the University of Geneva’s streaming server. Using our prompter rental service in Geneva, GlobalVision participate actively to the event and demonstrate, once again, that major high-profile events in Geneva are made more easy with our professional services and the quality of our support personnel. Hence, we do not only limit to rental, but we provide a full advice and assistance service to ensure smooth and efficient coordination with our customer’s technical services. Consequently, we allow our customers to focus on other tasks, and when they land in Geneva, everything is setup, tested and ready for the official discourses. Recently, for a number of VVIP, high-profile and official allocutions, GlobalVision provided technical staff and advices about organizing conferences in Geneva. Our customers particularly appreciate our prompter rental service in Geneva. GlobalVision is proud to have installed prompters for public figures, such as Mr. Ban Ki Moon, Moritz Leuenberger, Shakira, Quincy Jones et Hillary Clinton. To get more information about our prompter rental service, contact our main office in Geneva.